During the last years, ExCard Research has conducted precise and efficient measurements of the QT-interval on thousands of ECGs in the course of numerous clinical trials, including thorough QT/QTc trials. All interval measurements are performed by highly trained physician electrocardiographers (physicians). All ECG readers are experienced in analyzing study ECGs from pharmacological studies, including definitive QT studies. 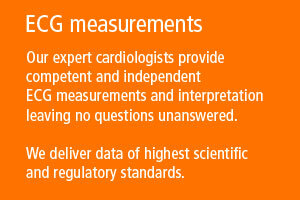 Measurements and ECG interpretation are checked and verified by cardiologists. One reader analyses all ECG recordings from a particular subject. All ECG readers undergo an intensive training course before trial ECGs are evaluated. The analysis of blinded ECGs ensures that metrics are available to demonstrate any intra- and interreader variability. To ensure consistency during the course of a trial, a subgroup of skilled readers is appointed prior to the start of the study.